As most 8043 Excavator owners know, LEGO has released a service pack to fix the Linear Actuator and tracks problem it had. We can say it is easy now to distinguish the new and the old LAs, while you have the old ones put in the Excavator and the new ones inside the Service Pack bag... Soon you may get them mixed and it will become hard to find the new ones, because they are not distinguishable at the first sight. Specially as you buy new sets with this revised part and if you use to store the parts of different sets together, as most of us do (I guess...). As explained before here, each LA has an engraved production code that would allow to distinguish among new and old actuators. So far the code being reported is 36X0 but it will change for each production lot. The codification consists of WWXY, where 'WW' is the calendar week number of production and 'Y' is the last digit from the year of production. This means that the new LAs are all those produced on week 36 from 2010 and after, whereas all those with earlier codes are from the initial design. Some fans have reported that they did not find any code similar to this, engraved in their LAs, but just the number 61927 instead. This is the LEGO Element ID for the LA itself (as you may see cataloged at BrickLink) and not the production codification. To make it clear where you will find both of this codes in your LAs, I've added the two pictures below. Click to enlarge - On the left image the Element ID, and on the right side the place where you will find the weekly Production Code (Week 52 of 2009, in this example). 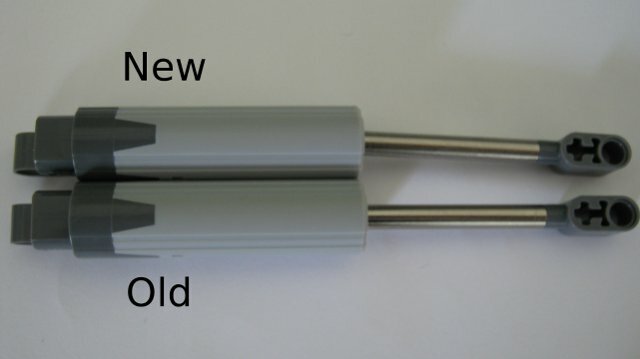 Another way to easily find whether a certain LA is from the original version or the revised one, could come from the observation about how much the rod bends when fully extended (slightly for the original ones, or a more noticeable bend for the newer ones). At least this method has the advantage of not being necessary to memorize the week code when the change happened. Now that the parts packs are reaching more and more people, the Technic team has published three videos explaining how to replace the LA’s on the Excavator without having to disassemble the whole contraption. You can watch them at the LEGO Technic Blog (currently it’s the top-most group of entries, but some time from now you’ll probably have to scroll down), or alternatively here below. Now, the tricky part is to correct the tracks problem (that’s what the rest of the service pack’s parts are for) without disassembling the whole thing... a video showing how to do that would be most interesting. It is said that 36x0 is the productioncode for the LA's that are in the servicepack. So from now on we have to look so close to know if a LA is "new" or "old". I'm not sure that the 2 first numbers are the week number. I think that's normal. It all depends which system is used to count weeks and when you start to count CW#1 each year. Nevertheless the information that I provided is not based on guessing, but insight information that I was given.